NOTE: To add a partner and purchase a place in this course, you must have already purchased another place in the same course at full price. Please ensure you do this in order to secure your place in this course. This beekeepers course is aimed at beginners and enthusiasts who want to learn about bees and keeping bees in a backyard, rooftop or suburban area. This course is run on one day from 8:30am – 4:00pm at our Apiary in Sutherland. Please be punctual we start the course at 8.30am sharp! We supply Morning Tea, Lunch and Afternoon Tea for $299. All our courses are based on the current Units of Competency as outlined by www.training.gov.au and reference material is based on the Agskills publication. 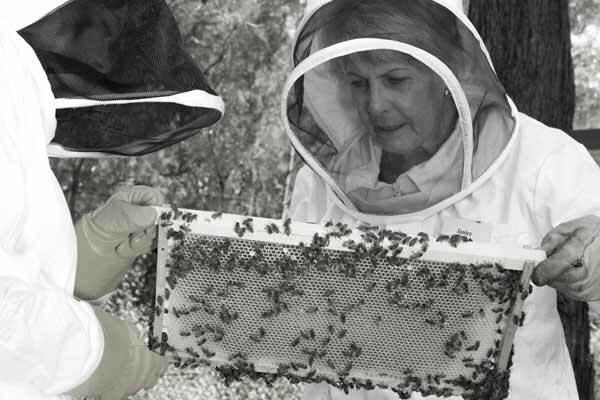 Our course begins with theory in the club house where you will learn all about bees from experienced beekeepers. After the theory, we usually pause for a cuppa at morning tea before heading head out to the apiary. The class will be split up in small groups so everyone gets a close up view and hands on experience as we open and inspect bee colonies in the yard. After a fully catered lunch we will continue with a little more theory before returning to the apiary to inspect the engine room of the colony… known as the brood box. The day will continue with more hands on experience then uncapping honeycomb, honey extraction, labelling and packaging your own jar of raw honey direct from our apiary to take home with you. We will supply you with protective clothing and gear as well as the use of smokers, bee hive tools and other accessories needed in the apiary. Thanks to our permanent apiary, the bees are housed in productive colonies managed by our apiary officer and helpers so we will always have good examples of working hives just a few meters from our club house. We are walking distance from Sutherland Station on the Bondi Junction to Illawarra (Cronulla or Waterfall lines). Head towards Eton Street [South] and walk through the park boom gate. The Beekeepers club house is across the cycle track (road) in front of you. Car parking is available on street at the southern end of Eton Street, near house number 96 Eton Street. Our actual address is Waratah Park, Eton St Sutherland NSW 2232. The gate to our facility is next to 96 Eton St Sutherland where you’ll see a boom gate to walk through. Note: These courses are limited to about 16 students so places will sell out fast. Book now to avoid disappointment.